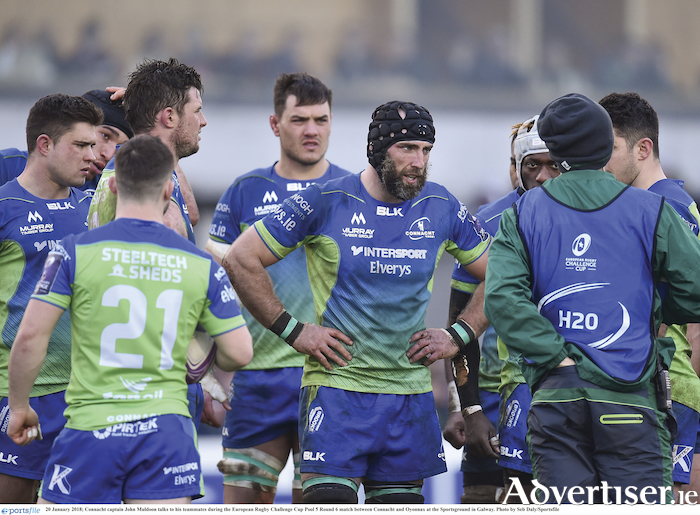 Inspirational Connacht captain John Muldoon (centre), who announced he will retire from playing at the end of the season, will lead Connacht in tomorrow's fixture against Ospreys at the Sportsground (7.35pm). Connacht refocus on their PRO 14 aspirations when the Ospreys visit the Galway Sportgsround tomorrow (7.35pm ). Having qualified for the Challenge Cup quarter-finals before the two-week break, Connacht now need to gain ground in the PRO 14 to nail down a Champions Cup qualifying spot. They have not made it easy on themselves by a poor start, but if they are going to make a puush for qualification, it must start tomorrow. Coach Kieran Keane insists there is still a lot of rugby to be played, starting with the Welsh visitors tomorrow Connacht are playing catch-up in the competition, so he is looking to start this new block with a "hiss and a roar". "We are up for this game, we know the importance of it, and if we don't fire a shot this week, that will be tremendously disappointing for everybody." Connacht, with two successive crunch fixtures in Conference A, are three points ahead of Friday evening's Welsh opponents, and seven in front of Zebre, before they head to Italy and South Africa. "There is still plenty for us to play for. We have our Challenge Cup aspirations, but they are a long way down the track, so now we have four big games, so there's a hell of a lot to do and to be achieved in this block." John Muldoon, who announced his retirement during the break, is expected to lead the side for what Keane describes as a tricky assignment. "They have so much experience in their team and have some highly-ranked Welsh players which makes them terribly dangerous for us. "Their forward pack has been quite impressive, as have their backs on occasions, so there are threats everywhere, and we are not sure who they will bring, so there is a little bit of angst there. "Europe was an opportunity for us to build momentum. We have stuttered throughout the season a little. We've had highs and some lows, both ends of the spectrum. The highs were magnificent and the lows dreadful and hard to deal with, so this block, we need to get the momentum we gained and carry it on. We are fresh, everyone is up for the challenge, all up, and the weather is getting better. "We are looking to get out of the blocks and continue where we left off, that is the theme. It is a challenge, they are a pretty good side, but we have to start well and these are important fixtures - the whole block of these games." Keane says Connacht also need to provide retiring captain John Muldoon with a fitting send off. "That is uppermost in my mind. The guy is a Connacht man through and through, and people love the man, who wouldn't, playing that number of games? "I am mindful we want to see him go out with a bang. He is clearly a one off, quite incredible, 318 games and counting. There is a lot of rugby to be played and he's up for it, it is a remarkable achievement my opinion and to be celebrated." "Why wouldn't we want to celebrate such a milestone. It's a fantastic achievement by the individual. He's a loyal Connacht man through and through, and we possibly might use him to build us up a little." Internationals Bundee Aki, Kieran Marmion, and Ultan Dillane will not be available, but there is a possibility Quinn Roux may return from Ireland camp. Also due to return are lock Andrew Browne, now fit to play after a long lay off with an Achilles injury, James Cannon (shoulder ), Craig Ronaldson (hip ), and Steve Crosbie (knee ).